As a company we aim to supply and provide the best service possible that gives our customers a finished job on time and to a high standard, with this creating a solid working environment with our staff and relationships with our customers. Working with Solid surface materials in both the private and commercial sectors such as Corian, Hi Macs, Hanex, Staron, Durat, Avonite, Wilsonart, Swanstone. Established in 1995, Eric Wilson & Co has grown from Eric Wilson starting out as a Freelance fabricator & installer to be supported now by a 20 strong workforce and a leading fabrication company in the commercial sector. We have established long relationships with our customers by providing them with a service that they can feel relaxed and comfortable with knowing we as a company will look to deliver to a high standard at all times. We support our customers or any other who would require technical information, helping in construction or design by seeing the best way our products can be incorporated into certain applications . 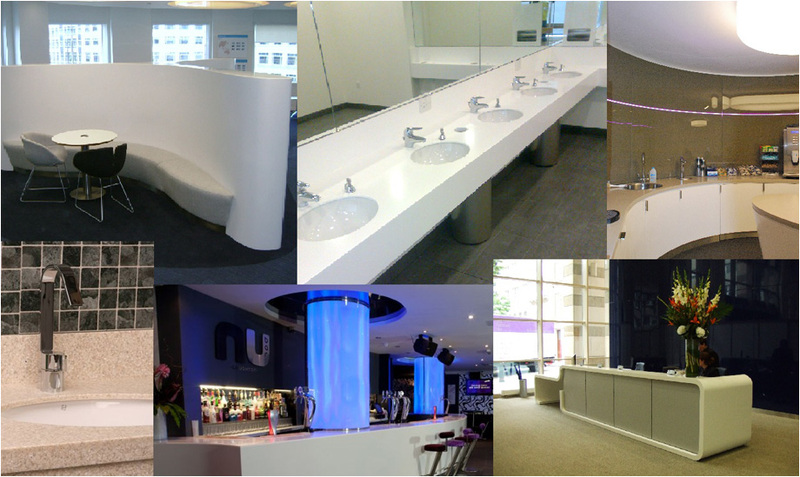 Using solid surface materials in Commercial areas , Joinery/Shopfitting , Hotels , Catering , Healthcare Dental / Hospitals. Eric Wilson & co has developed and invested into new technics and machinery over the past 2 years and we are looking to develop again to produce even more products. We provide a Manufacture , Installation & Template service. Using Corian, Hi Macs , Hanex , Staron , Avonite , Durat , Wilsonart. These Materials come with Company backed warranties , we are also part of the Dupont Corian Quality Network approved fabrication companies giving 10 years warranties to Dupont Corian Products.